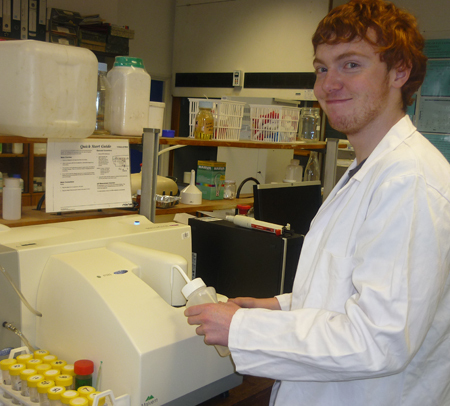 Rory McCaughan, a student from Ballymena Academy spent Summer 2011 working on soil sample analysis with the Agri-Food and Biosciences Institute. How would you describe yourself and your interests? I would describe myself as a hardworking young scientist. My main interest is natural chemistry, how life forms function and the chemical constituents of life. I have a wide interest into all fields of science and also read books on biological sciences and physics. I also have non-scientific interests in the form of weight training, Russian and computing! Really for my own experience of what it is like to work in a scientific place of work and to place on my CV to help express my dedication to science when applying for university. I also thought the placement could provide me an interesting and enjoyable experience which would give me something educational to do during my summer break from school. I spent my time doing field work and performing analytical experiments within a laboratory. I learnt a lot of information on biological and chemical sciences while working on my placement, my placement also confirmed my desire to study chemistry to university. I definitely would like to enter a career in chemistry, and am applying to university now. To do one! Placements are a fantastic opportunity to learn and enjoy your summer at the same time. After my placement I would say I would highly recommend anyone in Sixth form College or a further education college to attend a summer placement - the experience is certainly worth the time.